What makes the masters of twentieth century cinema great was the ambitiousness of their project. Kurosawa’s Ikiru (“To Live”), Bergman’s Wild Strawberries and The Seventh Seal, Fellini’s La Dolce Vita, Mizoguchi's Ugetsu and Antonioni’s L’avventura don’t shy away from grappling with life and death. Truly the twentieth century’s so-called art cinema is the equivalent of the Elizabethan- Jacobean era in theater and several directors reach the height of Shakespeare in the breadth and complexity of their visions. The great Indian director Satyajit Ray was one of these. 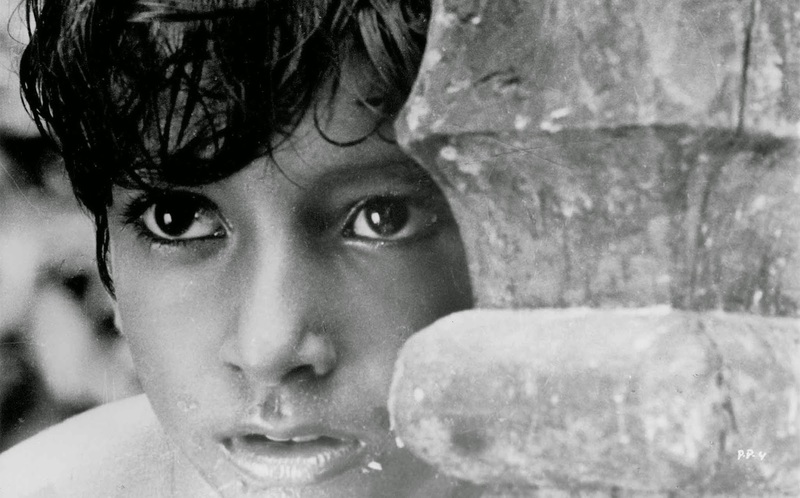 The first of his Apu Trilogy, Pather Panchali, currently playing in repertoire with his other two Apu films (Aparajito and Apu Sansar) at Film Forum, is unabashedly about the perception of life. It’s an eye opener to the extent that its central character Apu (Subir Banerjee) literally has his eye opened to reality when his sister Durga (played alternately by Runki Banerjee and Uma Dasgupta) pries his lid open to awaken him for school. Starting slowly the film builds its leitmotifs like a great symphony. Apu’s father Harihar (Kana Banerjee) is a writer and dreamer who can’t make a living to support his family. Durga is a bit of a thief, but for the good cause of nourishing her aged toothless auntie, Indir (Chunibala Devi). Sarbajaya, the mother (Karuna Banerjee) is slowly bending under the burden of feeding and clothing her family. But there’s a melancholy beauty to the proceedings. A seller of sweets appears at their door, along with beggars, and the children’s images are reflected in a lily covered pond as they follow him to the house of a less impoverished neighbor. In one of the films most compelling scenes, Apu and Durga make their way through a field of fronds, following overhead power lines in their search for the train, which they have heard but never seen. On the way back, they experience death for the first time, as they come upon Indir’s lifeless body and her signature water can rolls away. Is Ray estheticizing poverty? Joyce famously said, "sentimentality is unearned emotion." 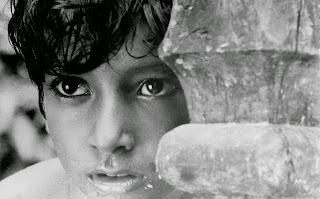 Pather Pachali is a real tear jerker, but the emotion is earned in spades. If one were to ask how, the answer might reside in a timeless moral dimension that goes beyond questions of class. The rich and the poor both make decisions that shape their lives forever and at the end that’s exactly what happens to Apu when he finds an stolen necklace and tosses it into a pond.There’s a certain moment in the experience of a truly great work of art when both its creator and its audience are jumping off a cliff. The viewer lets go because the artist has jumped and the effect is so profound that it defies encapsulation. The first of Ray’s trilogy is literally about everything. Its childhood world will remind you of other masterpieces of cinema (for example, Fanny and Alexander). But ultimately there’s no way to reduce the drama to its plot. Art has been deployed in the service of existence and the rest, to quote the playwright, is silence. Don’t miss the chance to view these films as they were intended to be seen, on a big screen, in a theater, in the company of others.